The Nissan Leaf Nismo Concept is a sportier take on the automaker's EV. TOKYO -- Nissan will tout its electric ambitions at this month's Tokyo Motor Show with a new concept vehicle alongside a sporty version of its just-unveiled next-generation Leaf electric vehicle. 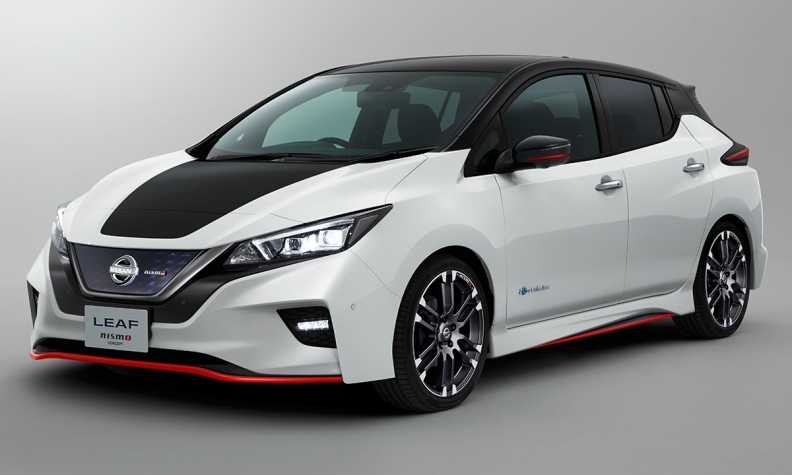 The Nissan Leaf Nismo Concept is a pulse-pumping take on the Japanese carmaker's flagship EV, with tuner treatment by its Nismo performance subbrand. Sporty exterior tweaks improve aerodynamic performance and reduce lift -- to keep the Nismo Leaf glued to the road for more exciting handling, Nissan said Tuesday here in an preview of its show plans. It also gets a sport-tuned suspension, high-performance tires and a custom-tuned computer that delivers "instant acceleration at all speeds," Nissan Motor Co. said. Red accents complete the Nismo look. "On the road, the Leaf Nismo Concept offers a truly exciting drive," the company said. The company will also unveil a concept vehicle that hints at the future direction of its "intelligent mobility" strategy. The concept will bundle three technologies Nissan positions as core to its brand: electrification, autonomous driving and connectivity. Nissan did not offer details about the concept. But it may be a long-awaited electrified crossover variant of the Leaf that executives have been hinting at for months. Daniele Schillaci, Nissan's executive vice president for zero emission vehicles as well as global marketing and sales, said just weeks ago it was reasonable to think the company would have an EV crossover in the "near future." Alliance partner Mitsubishi Motors Corp. plans its own electric crossover at the Tokyo show, a coupelike four-wheeler dubbed the e-Evolution Concept. In Tokyo, Nissan will expand on the performance theme with a Nismo version of the Serena, a Japan-market family van. That vehicle, which goes on sale in November, will deliver sharper handling and spunkier pickup thanks to a sportier suspension and new engine control unit. Nissan announced in the spring it wants to improve traction for the Nismo subbrand by embarking on a massive global expansion. It aims to double the number of nameplates getting the Nismo treatment and deliver a sixfold increase in sales over the next five years. The push could expand the line of Nismo offerings to new body types including crossovers, minivans and -- in the U.S. especially -- pickups. Tokyo's rollout of Nismo-badged vehicles foreshadows what is in store. Nissan will also show an updated Skyline sedan with new aluminum wheel designs, a reworked steering wheel and a refreshed shift knob. The car, sold in the U.S. as the Infiniti Q60, also aims for a more premium interior feel with a revamped instrument panel surface. The Skyline upgrade goes on sale in Japan in December.